Be the first to work with the iconic Australian Kangaroo Flower infused in Australian grown and cold pressed Sunflower Oil, high in Oleic Acid. This oil is offered to act as a partitioning agent cutting through the skin barrier, moisturising and nourishing the skin as well as the potential to assist absorption of other oil-soluble ingredients. This stunning and uniquely Australian flower is also known as the Kangaroo Paw because of its structure resembling the paw of the Kangaroo. The Kangaroo Flower infusion delivers a beautiful fatty acid profile and new imagery to create new stories and branding from the pristine ecosystems of Australia. 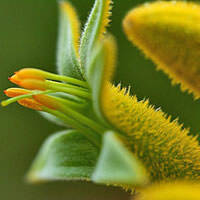 Also ask about the NE Kangaroo Paw Extract from our water-soluble range and discover the 'True to Nature' water-soluble blueprint this exciting flower has to offer.